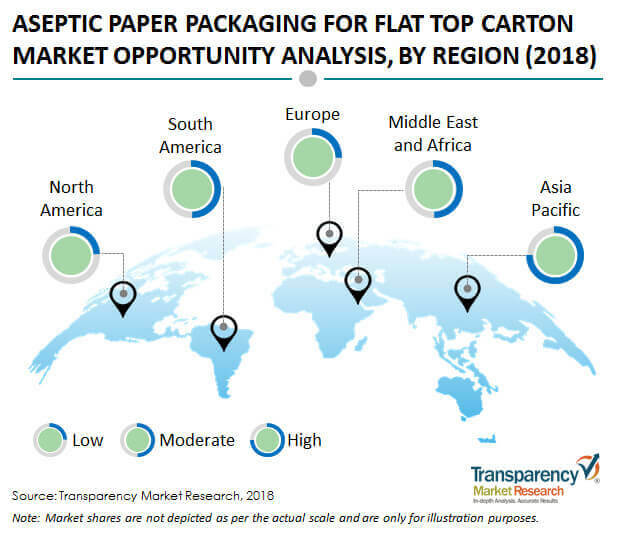 Transparency Market Research (TMR) delivers comprehensive data and key insights on the global aseptic paper packaging for flat top carton market in its published report, titled “Global Aseptic Paper Packaging for Flat Top Carton Market: Industry Analysis and Opportunity Assessment 2019–2027”. In terms of revenue, the global aseptic paper packaging for flat top carton market is estimated to expand at a CAGR of 5.5% during the forecast period, owing to several factors about which TMR provides an in-depth analysis. The Asia Pacific region is anticipated to dominate the aseptic paper packaging for flat top carton market during the forecast period. Aseptic paper packaging for flat top carton is a type of paper packaging solution used for manufacturing of flat top carton which are also known as Liquid Brick Carton or UHT Carton or Shelf Stable Carton. The global aseptic paper packaging for flat top carton market has been studied in a comprehensive manner, which includes segmentation by paper type, thickness, packaging structure type, and end use. As per paper type, the global aseptic paper packaging for flat top carton market is segmented into bleached paperboard and coated unbleached kraft paperboard. TMR suggests that the increasing preference for on-the-go beverages is driving the growth of the global aseptic paper packaging for flat top carton market during the forecast period. Liquid food products are usually packaged using plastics, which can produce high CO2 emission. This has influenced packaging solution providers to shift from conventional forms of packaging to eco-friendly packaging products like aseptic paper packaging for flat top carton. In addition, TMR comprehends that it is not possible for manufacturers and brand owners to provide 100% biodegradable packaging from aseptic paper packaging for flat top carton. Furthermore, owing to the extended shelf life provided by flat top cartons, numerous growth opportunities for aseptic paper packaging for flat top carton have been created. Geographically, the global aseptic paper packaging for flat top carton market is estimated to witness a high level of consumer preference and popularity in several regions like the Asia Pacific, the Middle East & Africa, and North America. The key manufacturers in the aseptic paper packaging for flat top carton market have been targeting consumers who prefer paper packaging applications like aseptic paper packaging for flat top carton made from bleached paperboard and coated unbleached kraft paperboard. In addition, consumer preference for Ultra-Heat Treatment (UHT) cartons which are the most affordable milk cartons is a factor driving the growth of the aseptic paper packaging for flat top carton market. Furthermore, the rising awareness for preservative-free food & beverages is increasing the need for aseptic paper packaging for flat top carton. Manufacturers of aseptic paper packaging for flat top carton are looking for positive opportunities from the Asia Pacific aseptic paper packaging for flat top carton market. On-to-go lifestyle in the Asia Pacific region is encouraging many of them to use liquid carton, creating more growth prospects for the aseptic paper packaging for flat top carton market. Furthermore, tamper-evident feature provided by flat top carton is expected to increase the demand for aseptic paper packaging for flat top carton during the forecast period. The key players profiled in the report on the global aseptic paper packaging for flat top carton market are – Refresco Gerber N.V., Nampak Ltd., Tetra Pak International S.A., Nippon Paper Industries Co., Ltd., Amcor Limited, Mondi Ltd., Elopak SA, Polyoak Packaging Group Ltd., IPI s.r.l., Weyerhaeuser Company, Uflex Ltd., Evergreen Packaging Inc., Ducart Group, Clearwater Paper Corporation, Lami Packaging Co. Ltd., TidePak Aseptic Packaging Material Co. Ltd., SIG Combibloc Obeikan (Pty) Ltd., Greatview Aseptic Packaging Co., Ltd., etc.